Linkwood, in the Speyside, is one of Diageo’s workhorses. Being included in last year’s collection of overpriced “special releases” hasn’t really raised its profile (in fact, I can’t remember reading any reviews of that bottle). I do remember some of my own reviews, however, and I was not a fan of the last Linkwood I reviewed. That was this 19 yo from 1997 that was part of K&L’s winter 2016 parcel of Signatory exclusives. It was quite a step down from the two previous Linkwoods I’d reviewed (another 19 yo from Chieftain’s and this 16 yo from Signatory). Here’s hoping this much older one (it’s a 30 yo) from 1984 will be much better. I’ve not had very many older Linkwoods, and the only others I’ve had from the 1980s (see this edition of “Quick Hits”) didn’t exactly set my world on fire either. 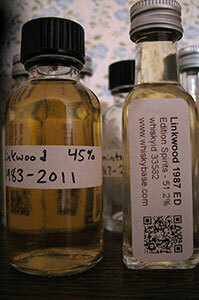 This Linkwood was also part of the larger Binny’s bottle split I coordinated a month and a half or so ago. I saved most of my share of the bottle for my local group’s March tasting and it went down a treat there. Here now are my own notes taken separately from a larger pour than we drink at our tastings. Another entry in the “Quick Hits” series: this time two Linkwoods from the 1980s. (Previously featured: two 1980s Inchgowers, and two 1960s Tomintouls). Once again, too little of each to form very confident appraisals and so there are no ratings and I would encourage you not to in any way consider these notes (or the previous entries in the series) as guides for making purchasing decisions.